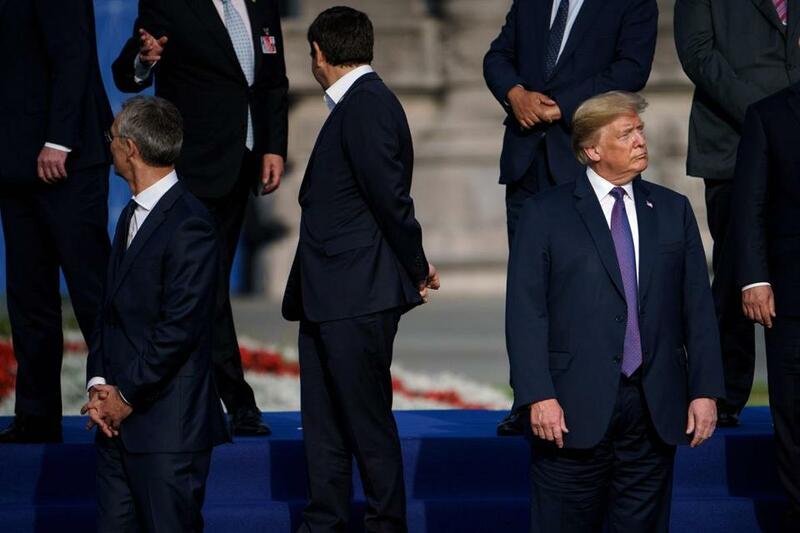 President Trump waits with NATO Secretary-General Jens Stoltenberg (at left) and other leaders in Brussels, on Wednesday during the NATO summit. Like millions of people in the United Kingdom, I have a deep and enduring affection for America. It’s not hard to explain why; I have studied in America, travelled in America, worked in America, and have made many American friends. During my time serving as a British government minister, I saw for myself in the villages and valleys of Afghanistan the shared service and sacrifice made by the US armed forces alongside British military personnel. I’ve sat with US presidents, vice presidents, and secretaries of state. Yet, this Friday I will be standing shoulder to shoulder with thousands of my fellow British citizens to protest the arrival of Donald Trump. We choose to demonstrate peacefully in our streets not because we disdain American values, but because we’ve come to admire them so much. 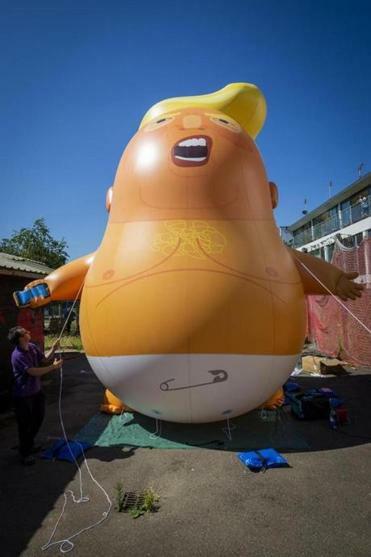 The British demonstrations are not directed against the people of the United States or the office of the presidency. They are directed solely against the present incumbent of that office and the agenda he seems intent on advancing. Ahead of the presiden’t visit, protesters have launched a campaign to play the Green Day song so many times that, by the time he arrives, the song is the No. 1 single in the country. As a British foreign office minister, I understood that sometimes diplomacy involves meeting those who have repellent views and repressive policies, but I also understand that, given our shared experience of defending democracy over tyranny, for the British public higher standards do and should apply to the US president. Some thought naively that the White House would change Donald Trump, but high office doesn’t change your character, it reveals it. Only last month, he ordered US government agents, on the southern border, to separate migrant children from their parents. Frightened and helpless toddlers were held in wire cages, with no proper registration. There’s reason to fear that many of these almost 3,000 children may never again see their parents. As a parent myself, this conscious cruelty appalls me. Yet, what was Trump’s response? Neutrality in the face of such immorality is the coward’s choice. By his words and his actions, Trump is taking a blowtorch not just to moral boundaries but also to standards and norms on which we rely as democracies on both sides of the Atlantic. It was in the aftermath of the horrors of holocaust and war that, 70 years ago, the West came together to build institutions and uphold ideas that became the international liberal order. Institutions like the United Nations, the European Union, and NATO. Ideas like democracy, an independent judiciary, and a free press. At the same time, he’s praised adversaries like Vladimir Putin and Kim Jong Un, while attacking allies like Justin Trudeau and Angela Merkel. Trump seems to believe in deals more than rules, and interests more than values. He represents an unprecedented departure from seven decades of US foreign policy, founded on the twin pillars of a rules-based international order and the transatlantic alliance. It’s hard to overstate just how un-American Trump’s words sound to so many of us across the Atlantic. Exactly one year before his assassination, April 4, 1967, Martin Luther King Jr. told a crowd at Riverside Baptist Church in New York: “A time comes when silence is betrayal.” Our silence when Trump is in the United Kingdom would, for many of us, represent just such a betrayal. The closest of friends, the strongest families, do not ignore tough conversations and difficult challenges. They meet them head on. Too much shared blood has been spilled and too many challenges faced together over many, many decades in the defense of our common values of Western liberal democracy for us now to remain silent as those values are threatened. The relationship between the United States and Britain has historically been at its deepest in the defense against external threats to liberal democracy. As a staunch ally, Britain would be failing in its friendship if it did not now call out the emerging threats to liberal democracy from within. Douglas Alexander, a former British Cabinet minister and member of Parliament, is a senior fellow at Harvard’s Kennedy School.